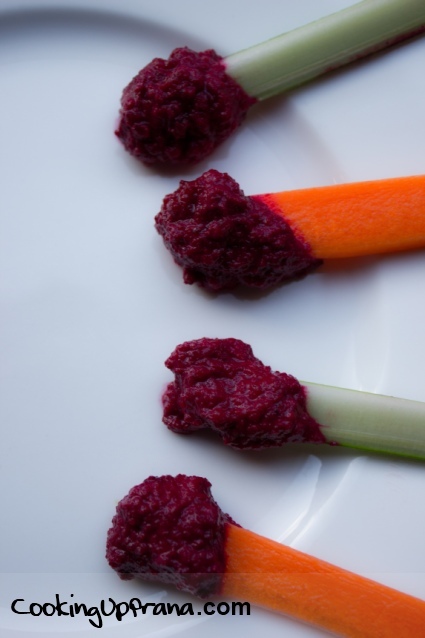 On a recent wine tour in the Yarra Valley of Australia I discovered a vendor selling the most delicious beetroot dip. I made my purchase along with a spicy chutney and along we went to the next winery. At some point someone (possibly and most likely me) sat on the bag containing the jam and beetroot and, in doing so, impaled the glass jam jar into the plastic beetroot dip container. The result: deep red beetroot dip explosion. Luckily, the delicious mess of a dip was contained within the bag and some of it was even salvageable. As I savored the remains that evening I thought that I could very well make some more… here is my attempt. 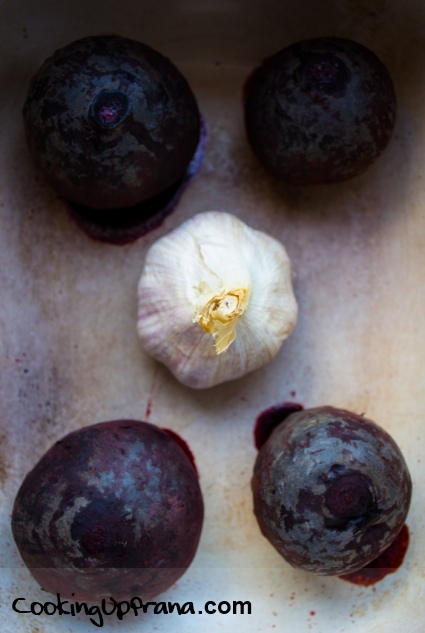 Choose small beets of roughly the same size- organic and stems on preferred for added freshness (you can cook the beet stems separately if you like. They are excellent for Kapha-Types). Choose an organic garlic. 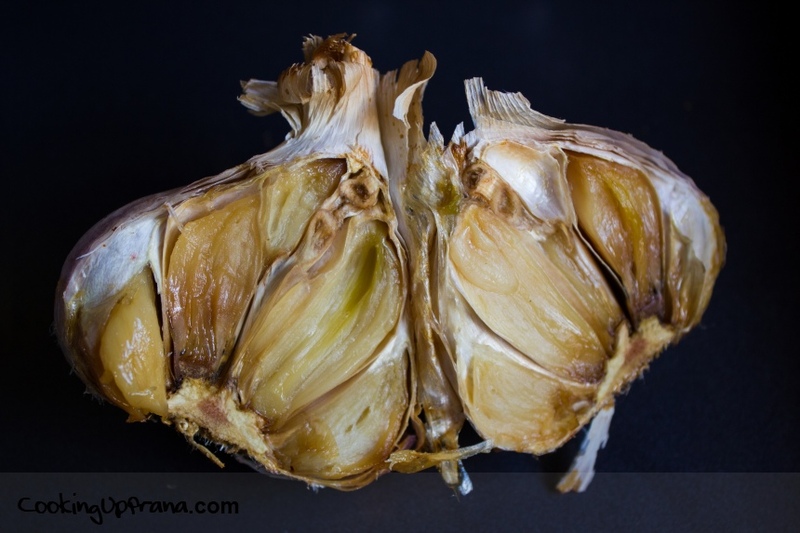 Though you will roast the whole bulb, only 3-4 cloves will be used for the recipe. Enjoy the rest however you like…it’s divine even on it’s own. 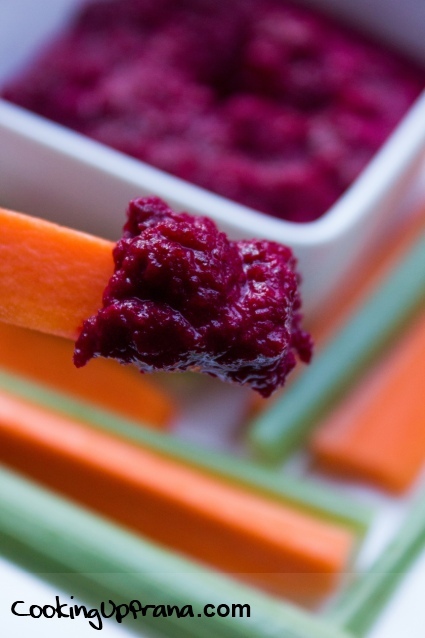 Enjoy the beetroot dip with carrot and fennel sticks. You might also try adding it on top of a fresh green salad or mixing it with rice for a cold rice salad with toasted pine nuts. Another option is to cut an avocado in half, remove the pit and stuff it with the dip. It makes an edible bowl and can serve either as a snack for one or an appetizer to share. Prepare the beets by cutting the greens away and scrubbing them well. Place in a dutch oven or lidded ovenproof casserole dish along with the garlic. Place in the oven and roast for 40 minutes. Remove the garlic The beets are done when you can easily pierce them with a knife. Remove from the oven and allow to cool. 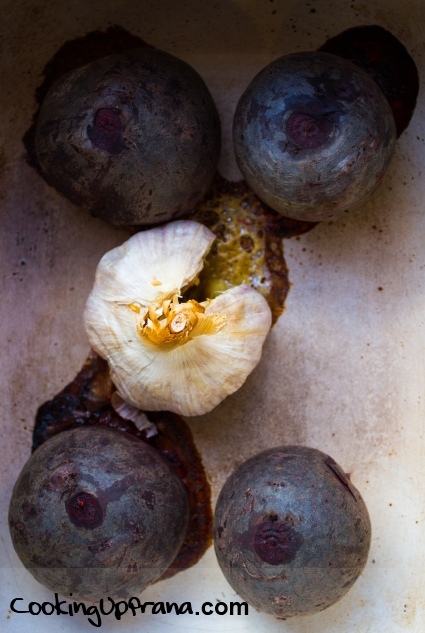 Cut off the ends of the beets and their skins should slip off easily. 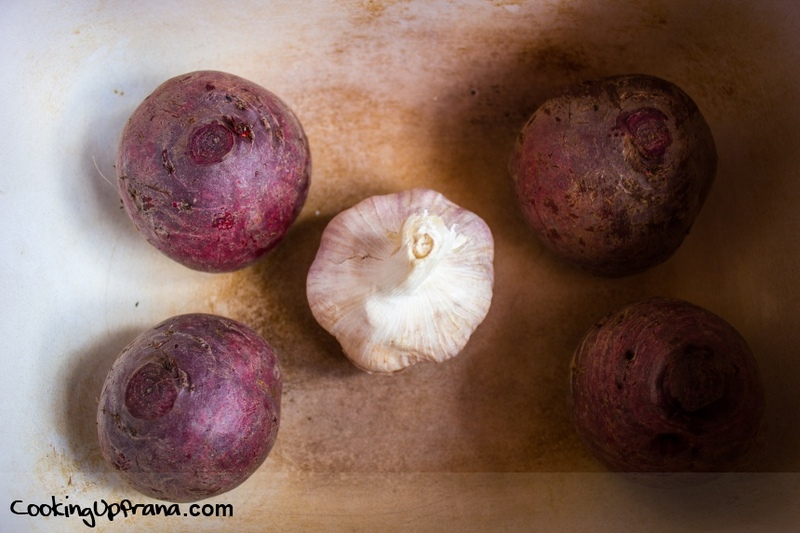 Add the beets, garlic, tahini, lemon juice, water, olive oil and sea salt to a food processor and mix well. Use the pulse button towards the end to create desired consistency. Substitute olive oil with sunflower oil. 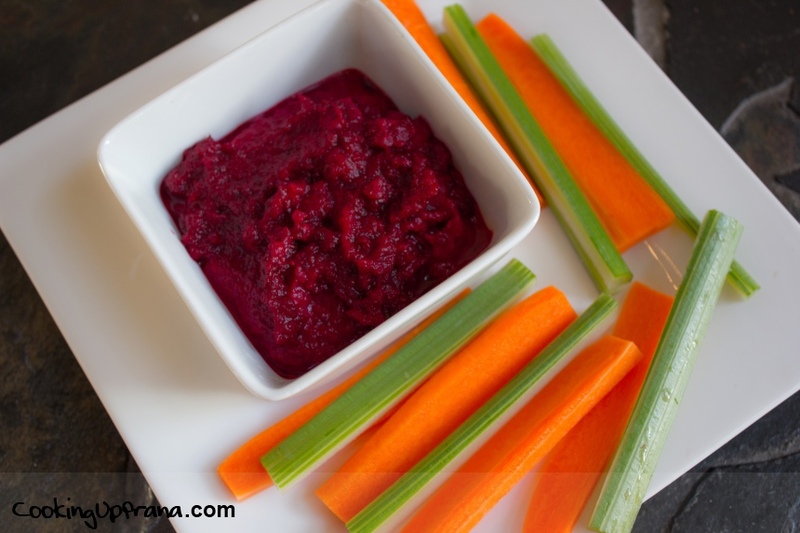 Enjoy in moderation due to the sweet and heavy nature of cooked beets.